Albert Camus once said that suicide is the only truly serious philosophical question. 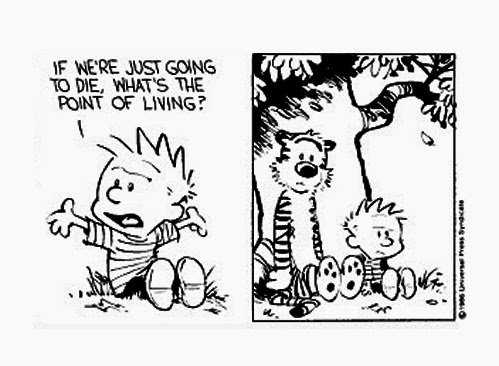 Is life worth living or not? Should we fear our deaths or hasten them? Is life absurd or overflowing with meaning? These are questions to which I am repeatedly drawn. Consequently, I have written quite a few posts about them over the years. Below, you'll find a complete list, in reverse chronological order, along with links. Is there something inferior about a life lived in virtual reality? Robert Nozick's experience machine argument suggests that there is. This post tries to unpack his claims, following Ben Bramble's article on the same topic. 2. Is Game-Playing the Highest Ideal of Human Existence? A look at Bernard Suits's claim that a utopian world would be a world of games. The text of a talk I delivered. It examines Richard Dawkins' 'Death makes us the lucky ones' argument at some length. Incorporates insights from some of the other posts listed below. The text of a keynote speech I gave discussing the end of work and its impact on the meaning of life. An examination of Robert Nozick's much-neglected argument for a meta-utopia. It's part of his classic book Anarchy, State and Utopia but frequently ignored in discussions of that book. Are we the best guides to our own happiness or should we defer to scientific experts? 7. Is Death the Sculptor of Life or an Evil to be Vanquished? My examination/critique of an interesting paper by Davide Sisto which argues that death is essential to shaping our identities. 8. Should we be grateful for death? A look at Mikel Burley's paper "Atheism and the Gift of Life". The paper argues that death might be a fitting end to human life. 9. Should we experience existential gratitude? 10. Podcast - Does life have meaning in a world without work? 11. Understanding Nihilism: What if nothing matters? 13. Is God the Source of Meaning in Life? Does the fact that others will live on after we die contribute to the meaning of our lives? Samuel Scheffler argues that it does and this post examines his argument. An analysis of Steven Luper's "achievementist" account of meaning in life. Although I find the account intriguing, I'm not entirely convinced. This post critiques William Lane Craig's argument that, because humans are nothing but collections of molecules, their lives are devoid of moral value. Although ostensibly framed as a contribution to the debate on morality and religion, the argument also has significance for those who are interested in the meaning of life. This post looks at an argument from Dan Weijers. The argument claims that if we combine naturalism with a degree of techno-utopianism we arrive a robust account of meaning in life. This contrasts quite dramatically with Craig's belief that naturalism entails the end of meaning. 23. Are we Cosmically Significant? If you look up at the stars at night, it's easy to become overawed at the vastness of our universe. It is so mind-bogglingly large and we are so small. Does this fact make our lives less significant? Guy Kahane argues that it doesn't. This post analyses his argument. 24. Must we Pursue Good Causes to Have Meaningful Lives? Philosopher Aaron Smuts defends the Good Cause Account (GCA) of meaning in life. According to this account, our lives are meaningful in virtue of and in proportion to the amount of objective good for which they are causally responsible. These two posts cover his defence of the GCA. Thomas Nagel has probably written the most famous paper on the absurdity of life. Many people refer to this paper for knockdown critiques of "bad" arguments for the absurdity of life, while ignoring the fact that Nagel himself thinks that life is absurd. In this two-part series I revisit Nagel's famous paper. I suggest that some of his knockdown critiques are not-so good, and I outline Nagel's own defence of the absurdity of life. 26. Should we Thanatise our Desires? The ancient philosophy of Epicureanism has long fascinated me. Epicureans developed some interesting arguments about our fear of death and developed a general philosophy of life. One key element of this philosophy was that we should live in a way that is compatible with our eventual deaths. One way to do this was to thanatise our desires, i.e. render them immune to being thwarted or unfulfilled by death. This post asks whether this is sensible advice. Lucretius was a follower of Epicureanism. In one of the passages from his work De Rerum Natura, he defends something that has become known as the symmetry argument. This argument claims that death is not bad for us because it is like the period of non-existence before our births. In other words, it claims that pre-natal non-being is symmetrical to post-mortem non-being. Many philosophers dispute this claim of symmetry. In these two posts, I look at some recent papers on this famous argument. 28. Would Immortality be Desirable? If we assume that death is bad, does it follow that immortality is desirable? Maybe not. Bernard Williams's famous paper - "The Makropulos Case: Reflections on the Tedium of Immortality" famously makes this case. In these three posts, I look at Aaron Smuts updated defence of this view. Smuts rejects Williams's argument, as well of the arguments of others, and introduces a novel argument against the desirability of immortality. 29. Is Death Bad or Just Less Good? This is another series of posts about Epicureanism. In addition to the Lucretian symmetry argument, there was another famous Epicurean argument against the badness of death. That argument came from Epicurus himself and claimed that death was nothing to us because it was an experiential blank. In these four posts, I look at Aaron Smuts's defence of this Epicurean argument. The links between religion and the meaning of life are long-standing. For many religious believers, it is impossible to imagine a meaningful life in a Godless universe. One such believer is William Lane Craig. These two posts look at Gianluca Di Muzio's critique of Craig's view. Back when I used to do podcasts, I did two episodes on meaning in life. One looking at a debate between Thomas Nagel and William Lane Craig on the absurdity of life. The other looking at the possibility of living a transcendent life without God. Should we bet on radical enhancement?